Last week at work I did something that I don't often do: I left the office for lunch. It's pathetic, I know, but I rarely leave my desk to go enjoy lunch outside of the office. I typically opt for packing soup, salad, and leftovers at my desk while finishing up projects on a busy day or catching up on Perez Hilton (guilty) on less busy days. I work downtown in the Chicago Loop where restaurants are not lacking, but decent lunch options that are tasty, inexpensive, and not super processed fast food certainly are. I have a few places in my rotation, but was in need of some more variety. And then came Naansense. 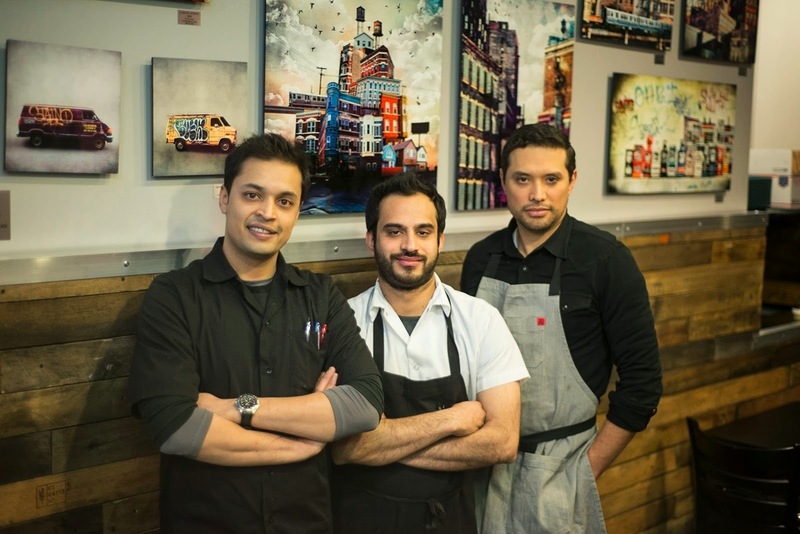 Naansense is the brainchild of 3 chefs (Patel, Singh, and Cabrera) with impressive local and global resumes. They came together and created Naansense, a fast casual lunch spot specializing in contemporary Indian cuisine with global influences. The menu has tons of options from vegetarian fritters to lamb and from naanwiches to salads to rice bowls, there is something for everyone. Even for the short time that they have been open, I have heard great things about this place from friends and other bloggers (I even ran into a few when I stopped by-- hey Lauren and Katie!). Intrigued, I grabbed a friend and headed into Naansense to see what all the hype was about. My friend Alexis and I stopped in for a late lunch on a Friday and were so surprised to see that Naansense was still busy with a line several people long in their cozy space-- a sign of a good restaurant, for sure. Chef told us to grab a seat and he'd put together a few of his favorite combos for us to sample and we happily obliged. First up was their soup of the week. Naansense changes up their featured soup every week and this time it was a spicy and smoky tomato soup. It had some real heat and chef told us that it was also made completely vegan with rich coconut milk and some fresh cilantro and crunchy chickpea noodles for garnish. I was loving the spicy soup with a bite of their freshly baked naan. Naan flatbread is so good, but especially when it is freshly baked the traditional way. Super tasty! Next, Alexis and I sampled two bowls that chef put together. They have a few on their menu that the chefs have already put together, but everything else is totally customizable and available a la carte-- ordering works similarly to a Chipotle or Roti with the ingredients all arranged in a line in front of you. Our first bowl was tandoori chicken and roasted vegetables served over brown rice and mixed greens. I loved the combo of soft roasted peppers and cauliflower here. It was really unexpected and delicious-- all tossed in a combination of a bright yogurt and garam masala dressing and creamy garlic yogurt. It was topped off with some lightly pickled veggies like cucumbers, red onions, cabbage, and red bell pepper, which added the perfect crunch and tang to this savory dish. Our second bowl was filled with white rice and Naansense's spice rubbed lamb. I was a bit skeptical because I am not normally a lamb fan, but you guys, this was truly delicious and one of the best things we tried here. The lamb was fork tender and super flavorful from both the aromatic spices and the delicious Korma sauce (a combo of pistachios, cardamom, and ginger. It was garnished with those delicious pickled veggies, a little fresh cilantro, and a drizzle of cool yogurt. And we couldn't get enough... this plate was cleaned quickly! The game changer for any meal at Naansense is really the Masala Fries. A few other bloggers had been to Naansense already and wrote about their meal experiences-- raving about the fries-- so I had high expectations. Well, they are incredible! The fries are crispy, salty, and the Masala spice is unexpected, but so tasty. The best part is that they serve the fries with a curry mayo that the affectionately refer to as "crack sauce" because it is so addictive. It was everything wonderful: a creamy, tangy, spicy, and sweet yellow sauce. And I was scraping the bottom of the container with my last fries to get it all. 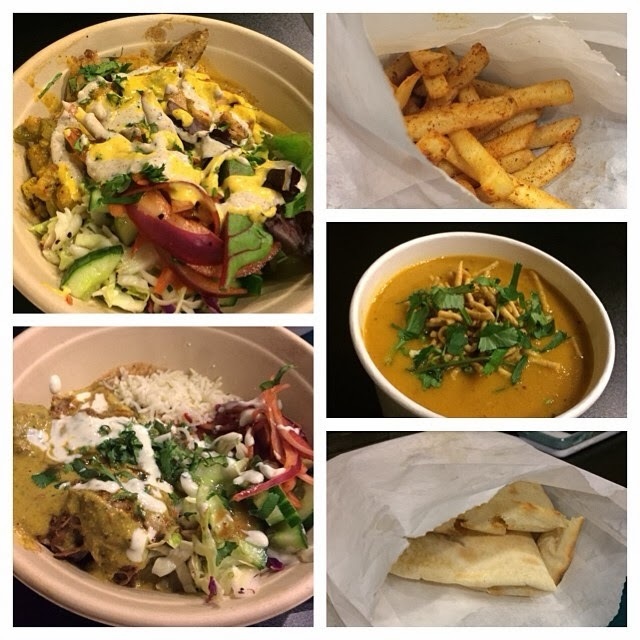 Naansense is such a great addition to the Loop lunch scene and I hope you'll stop in and give it a try! Not only are the chefs gracious and clearly passionate about what they do, but they're creating good and real food in a fast casual environment... and that is hard to come by. Naansense is located at 171 N. Wells St., just south of Lake St.
Editor's Note: Our meal at Naansense was provided at no charge, however the opinions expressed here, as always, are my own. Thanks, Naansense! Yum! I've been dreaming about going back- maybe we will have to leave our desks soon and meet up on purpose! Yes, let's meet for lunch on purpose sometime!